This chapter builds on the comprehensive summary of climate change scenarios in the first BACC assessment published in 2008. This chapter first addresses the dynamical downscaling of general circulation model (GCM) results to the regional scale, focussing on results from 13 regional climate model (RCM) simulations in the ENSEMBLES project as this European-scale ensemble simulation is also relevant for the Baltic Sea region and many studies on temperature, precipitation, wind speed and snow amounts have been performed. This chapter then reviews statistical downscaling studies that use large-scale atmospheric variables (predictors) to estimate possible future change in several smaller scale fields (predictands), with the greatest emphasis given to hydrological variables (such as precipitation and run-off). For the Baltic Sea basin, the findings of the statistical downscaling studies are generally in line with studies employing dynamical downscaling. 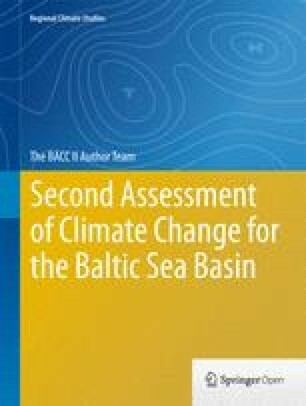 A comprehensive summary of existing scenarios for the Baltic Sea region up to 2006 was published in the first assessment of climate change for the Baltic Sea basin (BACC Author Team 2008). Since then several large systematic efforts have been made to perform numerical model simulations and extract knowledge about anthropogenic climate change in this region. At the international level, a large number of global climate change scenarios have been produced over recent decades in climate model intercomparison projects (CMIP), often in connection with work on the latest Intergovernmental Panel on Climate Change (IPCC) assessment reports (IPCC 2001, 2007). The fourth IPCC assessment report (IPCC 2007) built on the World Climate Research Programme’s (WCRP) Coupled Model Intercomparison Project phase 3 (CMIP3) multi-model data set (Meehl et al. 2007) with the participation of many general circulation models (GCMs) and use of several IPCC SRES scenarios (Nakićenović et al. 2000). At the European level, some of these scenarios have been dynamically or statistically downscaled to a higher horizontal resolution allowing for detailed analysis of climate change on a local to regional scale. Regional climate model (RCM) simulations in the PRUDENCE project (Christensen and Christensen 2007) have been analysed, and simulations from the ENSEMBLES project (van der Linden and Mitchell 2009) have been made publicly available and analysed (e.g. Hanel and Buishand 2011; Kyselý et al. 2011; Räisänen and Eklund 2011; Déqué et al. 2012; Kjellström et al. 2013) and used for impact studies (e.g. Wetterhall et al. 2011). Finally, at the Baltic Sea level, several national initiatives have resulted in extensive analyses of possible climatic futures for areas including the Baltic Sea basin (e.g. Lind and Kjellström 2008; Kjellström and Lind 2009; Benestad 2011; Kjellström et al. 2011a; Nikulin et al. 2011). Probabilistic climate change information has been derived from the GCM scenarios (Räisänen 2010) and RCM scenarios (Buser et al. 2010; Donat et al. 2011). In addition, the wider range of GCM scenarios has been used to set regional scenarios in a broader context (Lind and Kjellström 2008). This chapter relies on existing literature on climate change scenarios with a focus on northern Europe and in particular the Baltic Sea region. Some original summarising plots of public data from the ENSEMBLES project have been added because not all of the expected analyses of the ENSEMBLES archive have yet been published; at the same time, this collection of RCM data is an essential improvement on the state of the science since the first BACC assessment. For a more detailed description of GCMs and downscaling techniques, see Chap. 10 as well as IPCC (2007) and BACC Author Team (2008) and references therein. Much literature exists related to past and present climate change in the Baltic Sea, and conversely about future climate at the European scale, but there is little targeted research on future climate change in the Baltic Sea area. Most RCMs do not include a dynamic ocean model, implying that the surface properties for the Baltic Sea (sea surface temperatures—SSTs—and sea ice) are taken directly from the driving GCM. As the GCMs have only a very crude representation of the Baltic Sea, this constitutes an additional source of uncertainty for the regional scenarios. Based on experiments with the Rossby Centre RCM RCAO in both coupled and uncoupled mode, Meier et al. (2011) concluded that the coupled model version has the potential to improve the results of downscaling considerably, as SSTs and sea-ice conditions are more realistic than in the corresponding GCMs. However, their results show that differences between the two model versions are different between different seasons with a greater improvement in summer compared to winter, since winter climate in the Baltic Sea region is more strongly governed by conditions over the North Atlantic. They also concluded that the parameterisation of air-sea fluxes needs improving in RCAO. The rest of this chapter focuses on results from atmosphere-only RCMs available at the time of writing (November 2012). The SRES emission scenarios—based on different storylines for the future development of world population and economy (Nakićenović et al. 2000)—were used in simulations for the IPCC’s Fourth Assessment (IPCC 2007). Hence, most existing climate change scenarios build on these emission scenarios. All SRES scenarios show rising amounts of greenhouse gases (GHGs) in the atmosphere leading to rising global temperature. Depending on the scenario selected, the amplitude of the projected climate change will differ. Even though mitigation effects are not explicitly incorporated in the SRES scenarios, the range in potential futures depends on GHG emission amounts which do reflect the expected effects of mitigation action. The difference in emissions between high and low emission scenarios lead to different climate change trajectories, most notably from the mid-twenty-first century onwards. For the next few decades, much of the expected warming will be accounted for by GHG concentration increases caused by historical and current emissions. Most downscaling experiments build on the SRES scenarios A2, A1B and B2, implying that the more extreme scenarios (A1FI on the high side and B1 on the low side) have not been studied as extensively. Pattern-scaling techniques have been used in order to ‘translate’ information between scenarios including the more extreme scenarios (e.g. Ruosteenoja et al. 2007; Kendon et al. 2010). Regional simulations for Europe with low-emission stabilisation scenarios exist with the ENSEMBLES E1 stabilisation scenario( see van Vuuren et al. (2007)). A very high emission scenario downscaling has also been performed (RCP 8.5, see Christensen 2011). However, none of these simulations have yet been analysed in the literature and no studies with specific focus on the Baltic Sea basin have been performed. The IPCC Fifth Assessment has used data from the CMIP5 project, which contains output from many more models, together with the IPCC’s new family of representative concentration pathway (RCP) scenarios (van Vuuren et al. 2011). Simulations for this archive had only just started to appear at the time of writing (end of 2012), and nothing had been published. Most regional climate change information from global models in the last few years originates from the CMIP3 project underlying the IPCC fourth assessment (IPCC 2007). In that project, about 20 different coupled atmosphere–ocean general circulation models (AOGCM) were used in a number of different experiments including simulations of the twentieth century with observed forcing and a number of SRES scenarios for the twenty-first century. In addition to GCM and scenario uncertainty , uncertainty due to natural variability was also considered in CMIP3. This was achieved by multiple simulations with individual GCMs that differed only in terms of their initial conditions. Extensive documentation of model performance and climate change projections are available (IPCC 2007). Downscaling of GCM results to the regional scale has been pursued with a number of RCMs in the context of EU-projects (e.g. PRUDENCE and ENSEMBLES), other international projects (Climate and Energy Systems in the Nordic region; Kjellström et al. 2011b) and national efforts (e.g. Iversen 2008; Kjellström et al. 2011a). Most of the existing scenarios are at a horizontal resolution of 50 or 25 km, but attempts have been made at even higher resolution, around 12 km by Larsen et al. (2009) and 10 km by Jacob et al. (2008). In addition to downscaling of climate change scenarios, observation-based reanalysis data sets have also been extensively downscaled, particularly in recent years (e.g. Feser et al. 2001; Hagemann et al. 2004; Christensen et al. 2010; Samuelsson et al. 2011). These experiments allow a comparison of RCM results and observational data for the most recent decades and thereby an evaluation of the RCMs (see also Chap. 10, Sect. 10.2.2). The international WCRP-sponsored CORDEX project (Giorgi et al. 2006, http://cordex.dmi.dk/) coordinates regional simulations for areas covering the whole Earth. European simulations at 12- and 50-km resolution have been performed by several institutions in Europe and publications based on these data are starting to appear (Vautard et al. 2013). Air temperatures in the Baltic Sea area are projected to increase with time, with the increase generally greater than the corresponding increase in global mean temperature. This is usually the case for land areas, which warm more quickly than sea areas but is also the case for the Baltic Sea region, largely due to the strong winter increase (Figs. 11.1, 11.2 and 11.3). This winter increase is the result of a positive feedback mechanism involving declining snow and sea-ice cover , leading to even higher temperatures—reduced snow and ice cover will enhance the absorption of sunlight, and so enable greater amounts of heat to be stored in the soil and water. The strong increase in winter daily mean temperature is most pronounced for the coldest episodes (Kjellström 2004). This is also the case for the most extreme daily maximum and minimum temperatures (Kjellström et al. 2007; Nikulin et al. 2011) with a significant decrease in probabilities of cold temperatures (Benestad 2011). In summer, warm extremes are projected to become more pronounced. For example, Nikulin et al. (2011) showed that warm extremes in today’s climate (1961–1990) with a 20-year return value (defined as the temperature that will be exceeded once every 20 years as a statistical average) will occur around once every 5 years in Scandinavia by 2071–2100 according to an ensemble of six RCM simulations, all downscaling GCMs under the SRES A1B scenario. Figure 11.1 shows the annual cycle of temperature change for northern Sweden according to 23 different CMIP3 GCM simulations as well as for the ENSEMBLES RCM simulations (see Table 11.1). An increase in temperature is evident in all seasons, despite a large spread between different GCMs in their response to the change in forcing. This large spread is directly reflected in downscaling studies. Figure 11.2 shows example results from 16 regional climate change simulations with the Rossby Centre RCM (Kjellström et al. 2011a). These simulations include different emission scenarios , different forcing GCMs and different ensemble members allowing an illustration of the uncertainties related to climate change, discussed in Chap. 10, Sect. 10.4.4. It is clear that the spread due to different GCMs contributes strongly to the overall uncertainty in northern Sweden. It is also apparent that overall uncertainty increases with time, as the spread between the 16 scenarios is greater for 2071–2100 (data points with ‘3’ in Fig. 11.2) than 2011–2040 (data points with ‘1’ in Fig. 11.2). Furthermore, the impact of different emission scenarios increases over time as can be seen by comparing the SRES scenarios A2, A1B and B1 simulated by the same ensemble member of ECHAM5 (denoted M, A and P in Fig. 11.2). Finally, the three ECHAM5 A1B simulations with ensemble members differing only in initial conditions (A, B and C in Fig. 11.2) show a large spread in temperature and precipitation change, illustrating that natural variability also contributes to uncertainty on longer time scales, such as the 30-year period used here. The relation between change in temperature and precipitation seems robust, since the results are near the straight line; however, amplitude as a function of emission scenario shows considerable uncertainty. An ensemble of 13 RCM simulations from the ENSEMBLES project was analysed in this chapter. The RCMs are listed in Table 11.1. This represents the complete set of ENSEMBLES regional simulations that extend to the end of the twenty-first century, except for the ICTP, UCLM and CNRM models which have been excluded from the extremes analysis as they use a different grid projection to the others and so cannot be directly compared. To ensure that the ensemble maps are directly comparable, they have also been excluded from the analysis of mean fields. For each grid point and each of the 13 RCM simulations, there is a value of the quantity in question, such as the projected change in summer temperature between 1961–1990 and 2070–2099. As an estimate of the spread, the 13 results were sorted producing an approximate 5th percentile corresponding to the lowest value, a median, and an approximate 95th percentile corresponding to the highest value. This is illustrated for surface air temperature in Fig. 11.3. An inter-model spread similar to that in Figs. 11.1 and 11.2 is also seen in Fig. 11.3. The north–south gradient of greatest warming in the north in winter is general, but there is a spread in the magnitude of the change. This spread is somewhat smaller than in the GCM results, as shown in the two panels of Fig. 11.1: the range for the GCM results is roughly 3–9 °C in winter and 1.5–6 °C in summer for northern Sweden, whereas the range for the RCM results is around 4–8 °C in winter and 1.5–4.5 °C in summer. An RCM ensemble sampling more of the GCM uncertainty than in the ENSEMBLES data and more emission scenarios than just SRES A1B is likely to result in a greater spread. Summer warming in the Baltic Sea basin is less than the winter warming and is relatively homogeneous across the area. The above-average warming over the Baltic Sea basin may be an artefact due to the lack of a coupled ocean model in the models used here (Meier et al. 2011). The highest percentile summer warming is large in the south-east of the region. This is related to the large-scale pattern of warming in Europe with the strongest summer warming in southern Europe. Also, in the very north-east of the region, there is a large warming, probably connected to ice-albedo feedback. Similar results also exist for other GCM/RCM combinations (Christensen and Christensen 2007; Kjellström et al. 2011a). The results shown in Fig. 11.3 are consistent with the results for an earlier period (2021–2050) based on a larger ensemble of RCM-GCMs as presented by Déqué et al. (2012). They found that even though the total uncertainty related to the choice of model combination (GCM/RCM) and sampling (natural variability) is large, it is still not enough to mask the temperature response, not even for the relatively short-term 2021–2050 time frame. A warmer atmosphere can hold more moisture , so in response to rising global temperatures, climate models also project an intensification of the global hydrological cycle (e.g. Held and Soden 2006). On a European scale, this implies more precipitation in northern Europe and less in southern Europe, both in winter and summer (Christensen et al. 2007). Between these areas of projected increase and projected decrease, there is a broad zone of 500–1000 km or more where only small changes are projected (e.g. Kjellström et al. 2011a). This transition zone shifts with the seasons and is located more to the south in winter and more to the north in summer. As a consequence, precipitation is projected to increase over the entire Baltic Sea run-off region in winter, while in summer, increased precipitation is mostly projected for the northern half of the basin only. In the south, precipitation is projected to change very little, although with a large spread between different models including both increases and decreases. There is a strong correlation between precipitation and temperature increase on an annual basis, as seen in Fig. 11.2. Figure 11.4 shows the annual cycle of precipitation change for northern Sweden according to the same CMIP3 simulations as in Fig. 11.1. Change in the seasonal cycle reveals greater projected increases in winter than in summer when some models show only small changes and in two cases even a decrease in precipitation. Projected changes in the seasonal cycle for individual models differ more than the corresponding changes in temperature implying that the overall uncertainty is greater for precipitation. Figure 11.5 shows the projected change in precipitation by the end of the twenty-first century for the same 13 ENSEMBLES simulations as in Fig. 11.3. For both winter and summer, there is a clear north–south gradient: the further north the more positive the change. An exception is the Norwegian west coast where relatively small increases, or even decreases, are projected in winter and in some case also in summer. This relatively small increase is related to change in the large-scale atmospheric circulation as the wind direction relative to the Scandinavian mountains largely determines the sign of change (e.g. Räisänen et al. 2004). Over the rest of the domain there is a clear increase in winter and changes of both signs in summer with an indication of a positive signal in the southernmost parts of the area. With a larger set of ENSEMBLES simulations, but a shorter-term future period, Déqué et al. (2012) found significant positive summer precipitation signals for almost all land points in the Baltic Sea catchment. As discussed in Sect. 11.5 for temperature, the spread in Fig. 11.5 for precipitation may also differ given a different set of GCM/RCM combinations as indicated by the spread in the larger range of GCMs in Fig. 11.4. Extreme weather events are very important for many aspects of society. Extreme precipitation is responsible for urban flooding , and this aspect of anthropogenic climate change has received considerable attention (see Chap. 22). As the water-holding capacity of the atmosphere increases under a warmer climate, precipitation extremes are also projected to increase (e.g. Lenderink and van Meijgaard 2010). Building on the PRUDENCE project, Christensen and Christensen (2003) reported that projections showing a considerable decrease in average summer precipitation also showed an increased likelihood of very extreme precipitation. More intense precipitation can be expected on time scales ranging from single rain showers to long-lasting synoptic-scale precipitation. It is likely that changes in precipitation extremes of a shorter duration may exceed those for longer time scales, as indicated by Lenderink and van Meijgaard (2010). They showed that the change in hourly precipitation extremes in one RCM considerably exceeded the prediction from the theoretical Clausius–Clapeyron relation that sets an upper bound on the water vapour content of the atmosphere. As an example of changes in daily precipitation, Nikulin et al. (2011) investigated an ensemble of RCM simulations with the RCA model and showed that the 20-year return value of precipitation extremes in the 1961–1990 period was projected to decrease to 6–10 years in 2071–2100 for summer over northern Europe and to 2–4 years in winter in Scandinavia. Similarly, Larsen et al. (2009) reported that the return period for 20-year rainfall events on a 1-hour basis decreased to 4 years over Sweden based on a high-resolution RCM integration. For the Rhine catchment, Hanel and Buishand (2011) investigated annual maxima of daily precipitation in 15 RCM simulations from the ENSEMBLES project and found an overestimation of the amount of these extremes, particularly in summer, when compared to a gridded observation set; this was partly attributed to a low density of observations used in constructing the gridded data set. The RCM models all projected increases of extreme precipitation with long return periods. An analysis covering the 13 models from the ENSEMBLES project listed in Table 11.1 is illustrated in Fig. 11.6. The change in extreme precipitation is shown calculated as 10-year return values (the daily precipitation amount so large that it will be exceeded only once every 10 years on average). The median signal is consistently positive across the domain. The increase in the Baltic Sea basin is of the same order for both summer and winter, but the inter-model spread is larger in summer, corresponding to the greater influence of local processes in this season. It is apparent that the relative change of the extreme precipitation in winter (Fig. 11.6) looks very much like the relative change in average precipitation (Fig. 11.5), indicating no change in the shape of the intensity distribution function. The situation is very different for summer, where the projected change in extreme precipitation is considerably more positive than the change in average precipitation. Changes in the wind climate are even more uncertain than is the case for the precipitation climate, both for seasonal mean conditions and for extremes on shorter time scales (e.g. Kjellström et al. 2011a; Nikulin et al. 2011). Figure 11.7 shows average changes over the Baltic Sea in 16 RCA3 simulations at three different time horizons in relation to the temperature change. It is evident that the correlation is much weaker than in the case of precipitation (cf. Fig. 11.1) and also that the changes are relatively small including mostly increasing, but in a few cases for one GCM decreasing wind speed. In many of the integrations, increasing wind speed is seen over ocean areas that are ice-covered in today’s climate but not in the future climate, probably due to reduced static stability in the lower atmosphere as the surface gets warmer (e.g. Kjellström et al. 2011a). The 13 ENSEMBLES RCMs of Table 11.1 are plotted in Fig. 11.8 for the projected change in average wind speed on a seasonal basis. The span of projected change is smaller than seen in Fig. 11.7 due to the small number of GCMs and the use of only one emission scenario (SRES A1B). For both winter and summer, the sign of the change varies but with a slight tendency towards an increase, particularly over sea areas (as is also indicated in Fig. 11.7). Extremes of wind speed are relevant for projections of change in storm frequency, although it should be noted that wind speeds in RCMs are grid point averages as well as averages over model time steps of a few minutes. The potential for wind power is proportional to the third power of the wind speed, and so it is relevant for wind speed to investigate extremes of wind power. Donat et al. (2011) investigated mid-century as well as end-of-century changes in the annual 98th percentile daily maximum wind in 14 ENSEMBLES RCM simulations for 2021–2050 and 11 models for 2070–2099 of which nine are part of the 13-member ensemble employed for the present analyses. The ensemble average, such as the driving GCMs, showed a tendency to increase in a belt from the British Isles to the Baltic Sea and a tendency to reduce in the Mediterranean area. Nikulin et al. (2011), based on an ensemble of one RCM downscaling six different GCMs under the A1B scenario , found increasing wind speed expressed as 20-year return periods of annual maximum wind speed over the Baltic Sea in five out of six simulations . Figure 11.9 shows the projected change in extreme wind speed, with the 10-year return value of daily maximum wind speed plotted as an example. It should be remembered that a maximum calculated by an RCM is an average over a model time step of several minutes as well as over the grid square in question. The models are the same 13 ENSEMBLES models as in Fig. 11.6. It is clear that the spread is greater than is the case for average change (see Fig. 11.8). There is a very slight and insignificant median increase in the lower part of the area, consistent with findings by Donat et al. (2011). Generally, there are changes of both signs over the entire area, with small median decreases in winter and small increases in summer over land grid points; but there is a large inter-model spread. Although rising temperatures are expected to lead to decreased snow cover, as more precipitation falls as rain and snow melt accelerates, they are also expected to lead to increased winter precipitation in Scandinavia, possibly compensating for the former effect. Changes in snow cover from climate models need to be analysed quantitatively in order to estimate the relative importance of these two counteracting effects. Data from the ENSEMBLES project were analysed by Räisänen and Eklund (2011) who concluded that snow volume will decrease across Europe in the future, even though the Scandinavian mountain areas may experience a slight and statistically insignificant increase. Such an increase was also proposed by Schuler et al. (2006) in a detailed study for Norway based on two RCM scenarios forced with different GCMs. The authors also pointed out that in extreme years, the maximum amount of snow could be greater than in extreme years of the recent past, even if snow amount is reduced on average. Figure 11.10 shows the projected change in average winter snow amount for 12 ENSEMBLES RCM models. One simulation (DMI-HIRHAM5_ARPEGE) with a known bug in the surface description was excluded because the error was judged to lead to unrealistic changes in snow amount. However, the error was not judged to have a decisive influence on the development of temperature and precipitation and so this model was included in the analyses reported in Sects. 11.5 and 11.6. Only very small high-altitude mountain areas in a few simulations are projected to experience an increase in snow amount. The southern half of the Baltic Sea region is projected to experience significant reductions in snow amount with median reductions of around 75 %. This section summarises the literature on the application of statistical downscaling methods for the Baltic Sea area that have become available since the first BACC assessment (BACC Author Team 2008). Statistical downscaling employs statistical relationships between large-scale variables (predictors) and smaller scale fields (predictands) such that, for example, robust changes in predictors as simulated by climate models can be used to estimate change in the predictands , assuming that the observation-based statistical relations themselves are stable under climate change. Predictors are frequently chosen as atmospheric fields, whereas predictands can be atmospheric, oceanic or related to ice. In this respect, a decision was made to include a review of publications on statistical downscaling even though the predictands may not be atmospheric. As discussed in Chap. 10, Sect. 10.1, the skill of GCMs to simulate change at regional and local scales is still lower than at the continental scale. Dynamical (RCM-based) and statistical downscaling techniques are alternative approaches, which may be used to try to bridge this gap. Chap. 10, Sect. 10.3, includes a more detailed description of statistical downscaling. The validity of each of the downscaling methods depends on certain assumptions. For statistical downscaling, the strongest assumption is that the observed relationship between large-scale climate anomalies and regional climate variables does not change in the future. This assumption is quite restrictive and may not always be fulfilled. More importantly, it cannot easily be verified. The choice of large-scale predictors, their physical relationship to the regional predictands, the plausibility of the stationarity of their mutual relationship and the uncertainties arising from the statistical model itself must all be carefully weighted before the results obtained by statistical downscaling can be incorporated in a decision-making process. On the other hand, if conducted properly, statistical downscaling may provide a more explicit analysis of the sources of variability of regional climates and thus may advance understanding of the possible drivers of regional climate change in the future. For variables that are unlikely to be incorporated in RCMs in the foreseeable future, such as ecosystem variables, statistical downscaling is the only method that provides an estimate of climate change impact, although always within the caveats mentioned before. On these grounds, statistical downscaling and dynamical downscaling should be viewed as complementary. Statistical downscaling methods have mostly been applied to climate variables that strongly depend on uncertain physical parameterisations within the models that may lack general validity, such as precipitation, cloudiness and extreme winds. The predictors used in statistical downscaling are normally chosen to be large-scale variables that are regarded as well simulated by climate models (see also Chap. 10). These variables tend to be fields with large spatial coherence, such as sea-level pressure (SLP) or geopotential height. However, it is not assured that the predictors that best describe the variability of a predictand in the twentieth century—which is the usual period for calibrating statistical downscaling models—will also be the ones that best estimate changes in the future. For instance, SLP and geopotential height are good predictors for observed seasonal mean winter precipitation in many areas of western Europe. However, in future climates, changes in precipitation may result not only from change in atmospheric circulation but also from changes in the water content of the atmosphere. Some analyses of statistical downscaling methods in the virtual world provided by climate models appear to indicate that for the Baltic Sea area this latter contribution cannot be neglected (Frías et al. 2006). For the Baltic Sea area, statistical downscaling methods have mostly been applied to estimate future changes in hydrological variables, such as precipitation and run-off, and storm-related variables such as wind. The usual large-scale predictors are SLP and geopotential height. One particular aspect of the applications of statistical downscaling to the Baltic Sea so far is the frequent use of nonlinear statistical methods, such as weather typing, fuzzy networks and clustering algorithms, whereas for other areas linear regression methods, such as principal component regression, have generally been more frequently found in the literature. Rogutov et al. (2008) gave an example of how a standard statistical downscaling method for precipitation should look. The authors considered the whole of western Europe, but the results are also relevant for the Baltic Sea area. The method used principal components regression, which has been applied not only for downscaling purposes but also for climate reconstructions based on proxy data since mathematically the problem is very similar. Both the predictor (SLP) and the predictand (precipitation) are decomposed by a previous principal component analysis, and the leading components are retained for further analysis. This ensures that the covariance matrices that result in the regression analysis are not singular, avoiding over-fitting of the statistical model. There is no clear rule to determine the optimal number of retained principal components, but the number can be approximately estimated by sensitivity calculations until the skill of the reconstructed predictand, when compared to observed data, does not grow. Linear regression methods produce predictands with the same probability distribution as the predictors. Since atmospheric circulation variables tend to be approximately normally distributed, linear statistical downscaling methods may work well to estimate changes in monthly, seasonal or annual precipitation, which also tend to be approximately normally distributed. However, this is not the case for daily precipitation . In this case, more sophisticated nonlinear methods are needed, for instance those based on classification of weather types (see Chap. 10, Sect. 10.3). Wetterhall et al. (2009) employed a classification scheme constructed on a fuzzy logic algorithm to estimate changes in daily precipitation over Sweden based on the output of the GCM HadAM3H driven by the SRES scenarios A2 and B2. They also employed a weather generator that takes into account the weather type and is able to replicate the serial autocorrelation of daily precipitation. The advantage of this approach is that it is in theory able to estimate changes not only in daily precipitation amount and occurrence but also in block maxima, that is, maximum 3- or 5-day precipitation. Under these two scenarios, and conditional on the GCM used, Wetterhall et al. (2009) found that precipitation in Sweden tended to increase in the twenty-first century and that the maximum 5-day precipitation also became larger (Fig. 11.11, panels b and c). This increase was not due to changes in the frequency of weather patterns in the future but rather to the increase in specific humidity in the atmosphere, roughly in accordance with the tests of statistical downscaling methods in simulated climates conducted by Frías et al. (2006). These conclusions were reached by driving the statistical downscaling method by different combinations of the meteorological forcing from the GCM, as illustrated in Fig. 11.11. This figure shows that the direct output of the GCM is not able to reproduce well the annual cycle of precipitation over Sweden and that it underestimates its amplitude and is biased high (panel c). The statistical downscaling method improves the GCM simulation and reproduces well the observed annual cycle when driven by the meteorological reanalysis or by a control simulation of the present-day climate (panel a). However, the statistical downscaling method does not indicate large changes in precipitation when driven by scenario simulations excluding changes in the atmospheric-specific humidity (panel a). Only when this variable is explicitly used to drive the statistical downscaling method are future precipitation changes evident (panel b). Downscaled precipitation can be used in conjunction with temperature to drive hydrological models and estimate changes in future run-off (see Chap. 12). However, there are important caveats to be borne in mind when applying climate model data to drive models of climate impacts, since climate impacts may be sensitive not only to the simulated relative changes in climate from the present state but also to the absolute level of temperatures and precipitation simulated by the climate model. Climate models are seldom bias free, that is, the simulated mean present climate may deviate from the observations, and sometimes by non-negligible amounts (IPCC 2007); therefore, the biases make the direct application of simulated or downscaled precipitation or temperature problematic. Often it is necessary to apply an empirical bias correction method. Sennikovs and Bethers (2009) proposed a bias correction method for precipitation and temperature that may be subsequently applied to drive a hydrological model in the eastern Baltic Sea area. The bias correction method is based on a spatially explicit comparison between the probability distribution function of the climate variables simulated by an RCM and those derived from observations. A correction function is applied to the simulated data that aligns the simulated and observed quantiles of the probability distribution. This correction function may in general be nonlinear, although in some cases a simple realignment of the mean and a re-scaling to obtain the same variance as the observations may be adequate. Sennikovs and Bethers (2009) applied their methodology to several RCMs participating in the European project PRUDENCE (Christensen and Christensen 2007), selecting the eastern Baltic Sea area for further analysis. They found that RCMs tend to produce a reasonable annual cycle of temperature but clearly overestimate precipitation in winter and underestimate precipitation in summer. By applying their bias correction method to daily precipitation , they were able to bring the model results much closer to observations. The same correction function would then be applied to the output of scenario simulations, under the assumption that the causes that produce the mean biases in the models remain unchanged under a future climate. The corrected values of precipitation and temperature were used by Apsīte et al. (2010) to drive a hydrological model to estimate changes in run-off in the eastern Baltic Sea catchment area. Future run-off will be modulated by changes in two factors. On the one hand, evaporation will tend to increase due to higher air temperatures, while on the other, precipitation is expected to increase, as simulated by most RCMs participating in the PRUDENCE project (Christensen and Christensen 2007). A surprising result of the study by Apsīte et al. (2010) was that the first factor seemed to be more important in the future, and river run-off would tend to decrease according to the RCM simulations analysed. Also, important is that the annual cycle of run-off tended to change considerably, with the late spring maximum observed in the present climate shifting to earlier seasons even into the months of January and February. This is a consequence of the rising temperatures and an earlier onset of the melt season, as well as changes in the annual cycle of precipitation and increased evaporation . This represents a major shift in the annual run-off cycle that may have profound consequences on many economic sectors should it remain unmanaged by reservoirs . However, the study by Apsīte et al. (2010) is based on the mean of data simulated by 21 models and does not indicate the spread of individual simulations. Previous projections of river run-off into the Baltic Sea indicated that the uncertainty was large enough to encompass a broad range of projections, from slight reductions to substantial increase (Graham 2004). In a further study aimed at reconstructing run-off in the past 500 years, Hansson et al. (2011) also applied a statistical downscaling method using predictors from climate reconstructions of atmospheric circulation and temperature. Although the study is not focused on future projections but rather on past evolution of run-off, their findings about past variability in river run-off were also interpreted in the context of future climate change. Hansson et al. (2011) briefly indicated that if their statistical downscaling model is correct, run-off would tend to increase in the northern Baltic Sea and decrease in the southern Baltic Sea. This result is mainly driven by the signal of increasing temperature in the northern Baltic Sea catchment area and by a decrease in precipitation in Central Europe. Chap. 12 deals explicitly with run-off projections. The estimates of changes in extreme wind events over a few days show similar characteristics to the estimates of changes in daily precipitation, and thus, similar downscaling methods have also been applied, again in classification algorithms. Leckebusch et al. (2008) presented a cluster analysis based on the k-means method to identify the weather situations that give rise to extreme winds in western Europe. The k-means method is a standard clustering algorithm that in this case was applied after a pre-filtering by Principal Component Analysis. The same algorithm was then applied to a climate change simulation with the model ECHAM4/OPYC3 driven by an older future scenario (IS92a) of changing GHG concentrations in the atmosphere. However, the basic results of this simulation are not qualitatively different from the more modern simulations based on SRES scenarios. The authors found that the frequency of extreme winds increases over the whole of western Europe and in the southern Baltic Sea, which is consistent with the simulated increase in the intensity of the North Atlantic Oscillation (NAO) in this model. It should be noted that many GCMs project an increase in the intensity of the NAO in the future. Finally, statistical downscaling methods have also been applied to the estimation of future changes in sea ice and snow in the Baltic Sea area (Jylhä et al. 2008). This study analyses the results of simulations by GCMs and RCMs participating in PRUDENCE over the Baltic Sea area driven by future scenarios of atmospheric GHG concentrations. However, to estimate changes in sea-ice cover the authors applied a statistical downscaling method, since the resolution of the RCM is too coarse to represent sea ice at the coastlines. The predictor in this regression model is air temperature and the regression model is calibrated using observations between 1902 and 2001. The calibrated regression model is then applied to the projected temperature change. In addition, a bias correction must be applied to account for the mean temperature bias in the model, since the formation of sea ice is a strongly nonlinear process that depends on absolute values of temperature and not only on the change in temperature. This study adopts the so-called delta change correction, which amounts to realigning the temperature simulation in the present climate simulation with the observed mean temperature, conserving the temperature change signal as given by the differences between scenario and present-day simulation. The main conclusion of the study is that coastal sea-ice cover will be dramatically reduced in the coming decades regardless of the future GHG emission scenario , even though SRES scenario A2 foresees the largest future GHG emissions and yields the largest reductions in sea-ice cover in the Baltic Sea (see also Chap. 13, Sect. 13.4 for potential changes in Baltic Sea ice). The future climate will get warmer, especially in winter. Changes increase with time and/or rising emissions of GHGs. There is a large spread between the different models, but they all project warming. Cold extremes in winter and warm extremes in summer are expected to change more than the average conditions, implying a narrower (broader) temperature distribution in winter (summer). Future precipitation will be higher than today. The increase is projected to be greatest in winter. In summer, models project an increase in the far north and a decrease in the south. For the transition zone between these two regions, the sign of change is uncertain. Precipitation extremes are expected to increase although with a higher degree of uncertainty compared to the projected change in temperature extremes. Future changes in wind speed are highly dependent on changes in the large-scale atmospheric circulation simulated by the GCMs. The results diverge and it is not possible to estimate whether there will be a general increase or decrease in wind speed in the future. A common feature of many model simulations , however, is an increase in wind speed over oceans that are ice-covered in the present climate but not in the future. Future changes in extreme wind speed are uncertain. The increased number of high-resolution regional model studies driven by many different GCMs has enabled a tighter connection with hydrological models, even though various forms of bias correction are necessary as an interface between the two types of model. Furthermore, the large number of available simulations enables some estimation of uncertainty of impacts. Statistical downscaling studies using atmospheric predictors have addressed several predictands , with the greatest emphasis given to hydrological variables. The findings of detailed studies have been in line with those from studies employing dynamical downscaling.